Peter And Paul: Friends Forever! 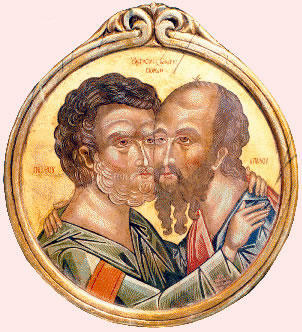 Icon of St. Peter (left) and St. Paul embracing. Original is in the Monastery of St. John on the island of Patmos. Well, not surprisingly, they all knew what a teen’s priorities should be—consequently the right hand column was almost identical for all of them. “God” or “religion” was at the top; “family” was next; “work” and “school” were almost always in the top 5. Of course, having a friend or a group of friends is one thing—having friends who exhibit the highest spiritual and moral values in their lives is quite another. And yet these are the types of friendships a Catholic Christian should desire and cultivate in his life, even if he’s well beyond his teenage years. I mention this today because this weekend we celebrate a feast in honor of two saints, Peter and Paul, who were also the best of friends. Even though they started off as enemies, and came from very different backgrounds—Peter was a fisherman; Paul was a well-educated Pharisee—God bridged the gap between them, uniting them both in life (as apostles and friends), and in death (tradition says they were both martyred in Rome on the very same day: Paul was beheaded, and Peter was crucified upside down in Nero’s Circus). In preparation for this homily, I thought about this friendship they shared, and I came up with the following 4 characteristics of it. As I share them with you, I would ask you to reflect on the quality of your closest earthly friendships. Do they embody these same 4 characteristics? (1) The friendship Peter and Paul shared was centered on Jesus Christ. What united them was a common desire to know, love and serve the Lord. That was the “glue” on their relationship. Is Christ at the center of your most-treasured friendships? Or is something else? It might be something like drinking (some teens—and even some older people—have as their best friends those who are willing to drink and party with them). Excessive gambling can be at the center of some friendships. It’s even possible for something good to be the glue that unites certain friends (for example, playing golf or some other sport). There are really many possibilities. (2) The friendship of Peter and Paul was marked by forgiveness. We know that because, before his conversion, Paul persecuted every Christian he could get his hands on—and he was an accomplice in the murder of the first Christian martyr, St. Stephen. So I think it’s safe to say that he was not Peter’s best buddy during that period of time! For that situation to change, Peter (with the help of God’s grace) had to make the hard decision to forgive Paul—which he obviously did. How willing are you to forgive your friends? Or when they hurt you once or twice is the relationship over? (3) In their friendship, Peter and Paul were not afraid to challenge and admonish one another when necessary. Paul’s letter to the Galatians makes this quite clear. In Galatians 2:10 we are told that Peter (and the other apostles) challenged Paul to be mindful of the poor when he went forth to preach the Gospel. And in the same chapter Paul mentions the fact that he once challenged Peter to be faithful and consistent in the witness he was giving to the Christians of Antioch. And why did they do this? Why did they challenge one other in these ways? It’s because each wanted the other to be a saint! Do you challenge your friends in a similar way and for this very same reason? Or do you and your friends lead each other into sin? (4) Peter and Paul had a friendship that was built on mutual respect. They didn’t tear each other down; they built one another up. For example, in his second letter, chapter 3, Peter refers to his friend as “our beloved brother Paul,” and extols his friend’s wisdom. Paul, in Galatians 1, mentions Peter as the first apostle he met after his conversion. Then, in the following chapter, he notes Peter’s approval of his missionary efforts to spread the Gospel. Obviously, Paul respected Peter and the position he held in the Church. Do you respect your friends and build them up? Or do you use them for your own pleasure and tear them down spiritually and morally in the process? As I said a few moments ago, the friendship of Peter and Paul linked them both in life (as apostles and missionaries), and in death (as martyrs who died for Christ on the same day). But, most importantly, their friendship has now linked them in eternity as saints. That’s why we celebrate this feast today. Michael W. Smith said it perfectly in his well-known song: “Friends are friends forever, if the Lord’s the Lord of them.” Peter and Paul are now friends in eternity, because the Lord was the Lord of each of them—and of their friendship—in this life. May the friendships we cultivate on this earth also bring us—and our friends—to God’s eternal kingdom.